Today we went to Jumpin' Jax with our playgroup and it was SO much fun! They have all kinds of gigantic blow up things from obstacle courses to slides to big bouncy things and the kids had a blast. However...it is very hard to keep up w/ two kids in a place like that. Taylor was all about going down the slide but Sutton was too scared at first. I must say these are some serious slides...much bigger than anything I have ever gone down. And you know I'm scared of heights so it created quite the predicament. Kelley took Taylor up and slid down with her first and she absolutely loved it and wanted to go again and again. Then Julie took Taylor up and slid down w/ her a couple of times. Finally Sutton decided she wanted to try it, so I put her on my hip and climbed all the way up this gigantic thing (scared myself) but trying to act like it was so fun. We got to the top and I put her in my lap and down we went. This is the fastest slide EVER! I screamed in Sutton's ear the entire way down (which was a whole 3 seconds at the most) but she absolutely loved it. Julie took Taylor to the top and Tay wanted to go down by herself! My little itty bitty was scared to slide down a 3 foot slide several weeks ago and now she's the big daredevil. She did great...did a little flip-over on the way down onto her belly but was grinning from ear to ear! Then Julie took Sutton to the top to see if she wanted to go down by herself and Sutton was hanging on tight to her so they slid together. I went down a couple more times w/ them both and then we called it a day. That is exhausting carrying kids up those stairs over and over. I am wiped out right now. We will definitely be going back there because it was a blast. The last picture is of all of the kids Taylor, Sutton, Emerson (their friend from school), Logan (the only little boy, bless his heart! ), and Samantha (who is our neighbor). The first two pictures are of the 3 amigos. 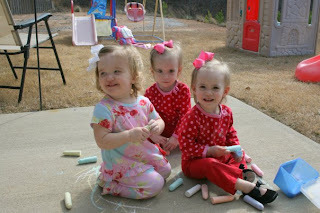 Sutton, Taylor and Emerson (or Emmie as Sutton calls her). The girls decided that Brobee, Bear, and Elmo all should be wearing diapers. Okay, so we have a biting problem. Take note of the bruised bite mark on Sutton's lower cheek. (Ignore the crusty nose and cookie chin.) Taylor bites when she gets mad and we cannot get her to stop! We spank her, put her in timeout, talk to her very calmly about it but nothing works. I would love to hear some ideas about how to get her to stop...here's the place to put your two cents in! She even bites me and let me tell you...it HURTS. The girls have had a virus since last Thursday but are slowly getting better. Sutton woke up last Thursday morning at 2:45 with a 104.7 temperature...scared me to death! Of course Taylor came down with it the following day. Taylor also has a really bad ear infection and Sutton had puss in her throat so you can imagine how yucky they have felt. Daddy blew up the air mattress and put it in the den so they could lay in bed and watch Yo Gabba Gabba, Blues Clues, and Elmo while they were puny. Taylor has overcome her fear of the slide and now she absolutely loves it. We had a good time at Muffins with Mom. The girls were obviously very timid about eating their muffins...yeah right! They both tried to shove the entire thing into their mouths at once. They gave me an adorable handpainted flower pot with pens made out of flowers for my "desk". (Gotta get one of those.) The flowers on the flower pot were made from their fingerprints. It is so cute! In fact I need to take a picture to post on here so you can see it. The weather was so nice today that we had to find something to do outdoors. We ran errands (bought new curtains for our bedroom...yippee!!) and then headed to the playground at church. There is a teeny weeny playground with stuff just the right size for Sutton & Taylor and they had a great time. We think Taylor might be afraid of heights because she is very apprehensive climbing stairs or climbing things on the playground. Even her teacher told me that she climbs up things but then gets scared and they have to get her down. She wanted to go down the slide so badly but when she would get to the top and look down she would make a terrible face and start whining so we held her hands for the first few times that she went down and then after that she was loving it. Here are some pictures of our day. These we all taken w/ my camera phone so they might not be all that clear. We have joined a new playgroup on Tuesdays and the girls are having an absolute blast! Their friend, Emerson, from MDO hosts the playgroup each Tuesday morning. Emerson's mom, Julie, was a kindergarten teacher before she quit to stay at home w/ her so she has tons of cute ideas for the girls for crafts, projects, etc. The outdoor pics are from a couple of weeks ago when it was nice and warm outside...unlike now. The indoor pics are from this week where they had a Valentine's Day party and did all kinds of cool things like decorate cookies, make VD ornaments, decorated treat sacks, etc. They had so much fun! 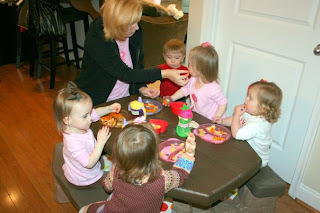 That day there were 9 kids, all 18 months and under, and Julie fixed lunch for everyone on top of all of the crafts...she was cool as a cucumber. I think that's the teacher in her! 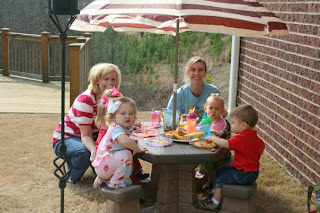 Last week on Thursday we had a playdate w/ our neighbor, Samantha. Samantha is about 2 weeks older than Sutton & Taylor and moved here from Dallas about 6 months ago. We have been trying to get together w/ her and her mom, Kelley, for a playdate for about 3 months but each time someone was sick. Now that we are all better we are playdating every which a way! 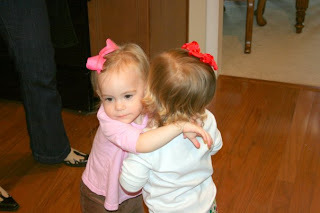 I am so glad the girls will have a friend to play with just a few doors down from us. These are the before pictures in the waiting area. They were both very serious for some reason, especially Taylor. Maybe she realizes how important a good cut is to a girl!